Head coach Julie Brzezinski emphasized the importance in using all three facets, including hitting, pitching and defense to ensure that her team wins. 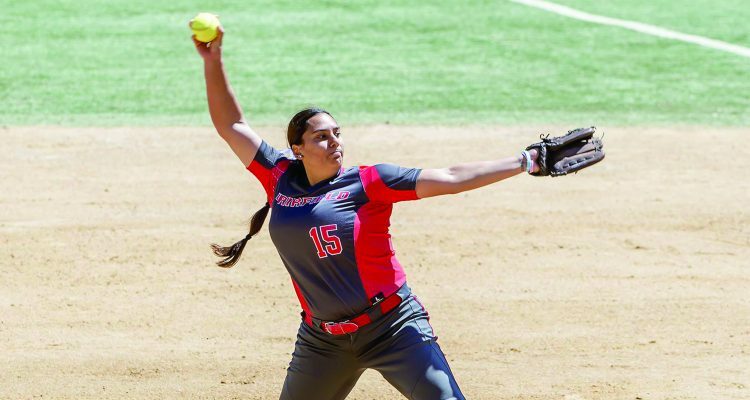 Over the weekend, the Fairfield University Softball team impressively displayed those three fundamental qualities as they proceeded to win four games, sweeping both doubleheaders. Metro Atlantic Athletic Conference games are important when it comes to seeding, which makes Fairfield’s road to a good seed much easier. In game one of the doubleheader against Manhattan College, the Stags started off hot with their bats, scoring five runs in the first three innings. Center fielder Angelina McGuire ‘19 smacked two home runs and drove in four runs. Senior Destinee Pallotto pitched a complete game while only allowing one earned run and surrendering five hits as well as striking out six batters. Only one Manhattan batter, outfielder Shannon Puthe ‘18, was able to register a multi-hit game as Pallotto kept hitters off balanced all game. The bats were alive early yet again for Fairfield as they jumped out to a seven run lead, in credit to five run scoring extra base-hits. McGuire connected for her third home run of the day in the second game of the doubleheader. First-year Lauryn Rhinehart also pitched a complete game, despite walking seven batters and allowing five hits and two earned runs. The Jaspers yet again struggled to have a good start from their starter as Nicole Williams ‘20 did not even complete her second inning of work. She was responsible for four of the seven earned runs allowed while Fairfield easily swept the doubleheader by outscoring Manhattan, 14-5. On the following day, Fairfield would take on MAAC rival Saint Peter’s University, looking for an undefeated weekend. After winning back-to-back games, the Stags were confident in facing a Saint Peter’s team with only three wins in 2018. Fairfield did not need as much offense as Pallotto took the mound again, once again throwing a complete game shutout, surrendering six hits and sitting eight batters down via the strikeout. However, Barbara Verrastro ‘19 also threw a complete game, allowing five hits, striking out five and walking two. She gave up three runs, but none were earned as she equaled Pallotto’s effectiveness, pitch-by-pitch. For the third time in four games, Fairfield scored runs early and often as seven different Stags drove in a run. Rhinehart threw her second complete game of the weekend as she just allowed one run and five hits. For the Peacocks, Sydney Ramsey ‘19 only lasted 1.1 innings after allowing four earned runs and walking two more. Runs were at a premium for Saint Peter’s since they only mustered one run in both games. With this double sweep by the Stags, they now have won five in a row and they are looking to put themselves in a good spot for the MAAC tournament. Pallotto and Rhinehart are an effective 1-2 punch that can shut down any offense and take over a game. Being 12-19 on the year and 4-2 in the MAAC, they face Sacred Heart University on Thursday, April 12 at 3:30 p.m.